At his literary best in the trilogy U.S.A., Dos Passos satirizes America’s worst bankers, presidents, and public relations men. Instead of following his peers’ lead and writing one charismatic frontman to attack his themes, Dos Passos paints American society as protagonist. His criticism, trained on every strata of society, recalls William Makepeace Thackeray’s Vanity Fair: A Novel Without a Hero, a work Dos Passos admired all his life. More than any prior fiction, U.S.A. evokes the national sprint for success from the 20th century to the edge of the Great Depression. 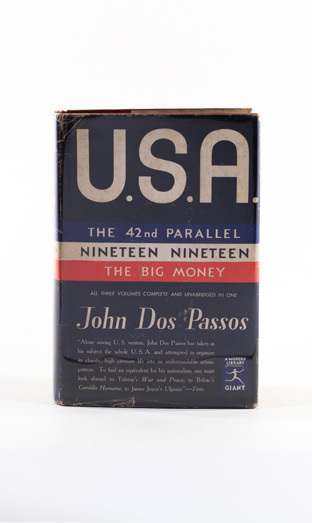 Dos Passos’s world of workers wonder what remains of the American Dream after mechanization, militarism, corporatism, and materialism render the joy from it. They redouble their efforts for a dollar only to see the economic elites lose all the nation’s winnings on Black Tuesday. The trilogy ends with an entry called “Vag,” about a hungry hitchhiker preparing for a long journey. Though bleak in its thematic outlook, U.S.A. presents a thrilling panoramic view of the nation’s great natural resources and cultural diversity. We see farms and factories abuzz with production, and trains, cars, and airplanes flashing from coast to coast, city to city. The speed of American business is always pushing the narrative forward and animating its characters. Dos Passos resembles Walt Whitman, Carl Sandburg, and even Bruce Springsteen in his taste for working-class Americana that both uplifts and enlightens. Blended with Dos Passos’s bitter satire of society’s well-financed connivers is delight for the littlest rebellions against governing systems—and the quirky personalities that spark them. The Library of America calls the trilogy a work of “sardonic comedy.” Horace Gregory of the New York Herald Tribune states that “only the most unresponsive reader would fail to appreciate the humor which is the force behind the keen stroke of Mr. Dos Passos’[s] irony.” The trilogy’s prologue states that “mostly U.S.A. is the speech of the people.” Dos Passos captures that voice. Equally as compelling as the trilogy’s themes is its experimental, multimedia style. Interspersed with standard narrative passages are popular newsreels, song lyrics, biographies of major figures, semi-autobiographical prose poems, and standard narrative. Biographies of J.P. Morgan, Henry Ford, Franklin Lloyd Wright, Woodrow Wilson, and the Unknown Soldier complete the mural effect produced by U.S.A.